Location: Bulair hotel is situated just 100 meters away from the centre of Bourgas, 200 m from the beach and in close vicinity to the Sea garden, and just 100 m from the Central bus station and Railway station. The hotel is the ideal site for a holiday or a business trip to Bourgas. Accommodation: Bulair Hotel offers 7 twin rooms, 6 double rooms and one studio. All of the rooms are equipped with a TV, Wi-Fi internet, safe, air conditioning, telephone, mini- bar and individual bathroom. Facilities: The hotel offers free parking spaces, 24 hour reception, free computer access, room service, dry cleaning, car hire, transfers to and from the airport, SPA center, rent a book from a library, etc. Wine & Dine: The hotel also offers a restaurant with a total capacity for 30 people. Tourists will be able to taste varied tasty dishes with a wide choice of selected drinks. 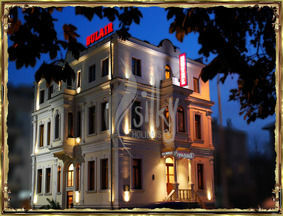 Each guest of the hotel can take advantage of 15 percent discount in the restaurant of the hotel. The restaurant offers a hall with a capacity of 40 people for business or festive events.